While I am no fan of valuation metrics, I do happen to be a student and believer of mean reversion. In an effort to attach a “value” to this market I’ve used an old Jeremy Grantham tool to see where we are today. 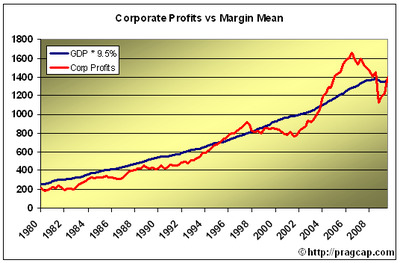 Grantham is a big believer in the cycle of corporate profits and specifically profit margins. As regular readers know, one of the primary reasons why we have been bullish ahead of the past 5 earnings seasons was due to the expansion in corporate margins and very low analyst expectations. Analysts became extremely negative in Q4 2008 and severely underestimated the pace at which companies were able to cut costs and support the bottom line. This stabilisation in corporate margins set the table for the massive rally in stocks as profits continued to expand at a far faster pace than anyone expected. 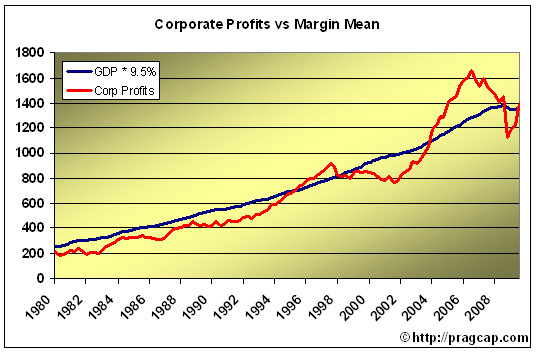 The latest reading shows that the market is slightly overvalued (by 5.5%) based on the sustainability of corporate profits. Unfortunately, mean reversion tends to overshoot in both directions so while the market is technically overvalued according to this metric it’s important to understand and respect the fact that margins are likely to continue expanding as the economy stabilizes. This could result in even greater market overvaluation (as we saw in 2006 & 2007). Of course, this is no silver bullet in terms of valuation metrics, but does provide us with a realistic perspective of where profits are and whether the market is currently overheated or not in terms of profit sustainability. In addition, it takes the analyst’s guesstimates and irrational market price action out of the equation. So while this by no means says that the market is due to correct or crash it does confirm one thing – the boom/bust cycle that the Fed has created is alive and well and we could very well be in the midst of another extreme overshoot to the upside in terms of profits and the sustainability of margins. And when margins begin to contract the market will surely bust again. Wax on. Wax off.